Taking private flute lessons with a professional teacher is highly beneficial for all music students, particularly those interested in wind or orchestral ensembles, but also for soloists and chamber musicians. Private flute teachers can guide students and help provide them with the tools they need to succeed in whichever bent they choose. Students will not only develop the technical skills to express themselves musically and creatively, but will also acquire the stage presence and practice techniques to achieve their goals. Because the flute is the most popular instrument in band, many students began playing in a band program, and many band-flutists or self-taught flutists, without having any private lessons, develop poor flute habits unintentionally. They may have an unhealthy posture, incorrect fingerings, and issues with their tone and breathing. After your brain and muscles learn poor habits, it is more difficult to change them. An experienced teacher can help students learn good habits right from the very beginning, and can fix any bad habits more efficiently. 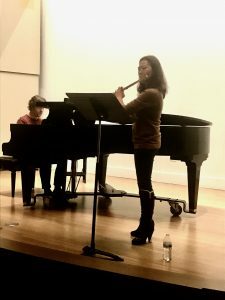 Flute instructor, Ms. Nayoung Ham at the Chopin Academy of Music in Issaquah is an active performer and educator with over 12 years teaching experience. She is a Doctoral Candidate at the Arizona State University in Flute Performance. In each lesson with Ms. Ham, students will improve flute fundamentals, such as tone production, technique, and flute repertoire. If the students have competitions or concerts to prepare for, that material can be covered when needed. Lesson books will be assigned on an individual basis, and students may order their music via https://www.fluteworld.com or through local music stores. If students, especially beginners, have no instrument, and are willing to rent, please check your local music stores for good condition flutes, or visit https://stores.musicarts.com/issaquah and check the available rentals. If you are considering buying a flute, please discuss this with your flute instructor, as they can help you buy a quality flute that fits students best. Like all students enrolled in private lessons, flute students of the Chopin Academy can enjoy frequent student recitals, usually monthly, and can freely attend all performance classes where CAM teachers help guide students on their performance etiquette, artistry, poise, and projection. Flute students, either enrolled in the “exam track” or “competition preparation” programs, may also perform several times a year at more prestigious centers, such as Benaroya Hall, the Meydenbauer Center, and now at Carnegie Hall in New York City. Students are accompanied during CAM concerts by a staff or student accompanist.